I have so enjoyed reading the Proper Romances. Yes, some of them are a bit cheesy, but I like not needing to worry about improper situations popping up. It’s refreshing to read stories without the distraction of the profanity as well. This is a fun one; I like the steampunk twist to it. I think it adds a fun and different angle. And you know I love a good retelling of the fairy tales! 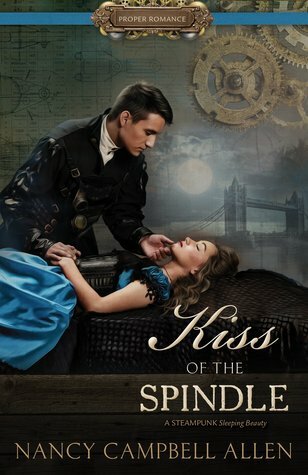 With all that, I hope you enjoy my book review of Kiss of the Spindle by Nancy Campbell Allen. “Doctor Isla Cooper is cursed. Literally. Each night, at the stroke of midnight she falls into a deep sleep from which she cannot be awakened for six hours. To make it worse, the curse has an expiration date—after a year, she will fall asleep forever. And the year is almost up. I’ve always loved Sleeping Beauty, and this book is a fun twist on that well-beloved story. I like the writing style of the book. It flows well, is easy to read and understand, and is a fun, entertaining read. The characters are well developed. I thought the author did a good job of making them realistic. They each have their strengths, weaknesses, flaws, and talents. I liked that there was a hint of mystery in each of them at the beginning, and that you learned more about them as the story went on. The steampunk aspect of the book adds a fun twist. I liked the descriptions of the airship, the telescribers, and the automatons. If I could really have my way I’d have a Samson to clean my house, do my laundry, and drive my kids everywhere. Haha! Wouldn’t that be amazing? It’d be like having your own personal butler or something. I’m all for that! I liked the story line as well. It was creative and unique, which I’m always glad about! I thought Isla’s curse could have been a little worse, but I understood how it affected her job and livelihood. It still could have been a few more hours or something, though. I thought it was sweet how Daniel worried about her so much. The side stories with the other characters were interesting, and the twist of how they fit together was a bit surprising. It’s comical that all the men fall for Isla. You feel like you could mop the floor with their drool. Come on boys! Pull yourselves together! I liked that Isla is a strong female character, but she also has her vulnerable moments. Overall, I enjoyed this story. It’s a fast, easy, entertaining read. It’s not going to solve the world’s problems, but it will give you a few min of respite from those problems. It’s a bit cheesy in a few parts, but I love a bit of cheese with my romance, so it’s fine. If you’re looking for something deep and mind blowing, this isn’t your book, but if you’re looking for a fun beach or summer read, look no further! I’m glad to hear you liked this one, Monica! It’s the next book on my reading list. Hi Loriann! Yes, I liked it! I think you’ll enjoy it. The steampunk twist was kind of fun!